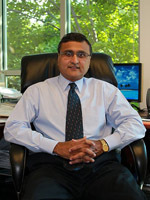 Dr.Kamdar has been practicing psychiatry since 1983, first on Long Island NY and since 1989, in Raleigh NC. He is experienced in the diagnosis and treatment of various psychiatric disorders and has a special interest in treating anxiety disorders, mood disorders including bipolar disorder and Adult Attention Deficit Disorder. He is board certified in adult psychiatry by the American Board of Psychiatry and Neurology. Dr. Kamdar’s treatment philosophy is to provide empathic, respectful care in the least restrictive environment and to involve the patient (and family if applicable) as an active partner in the ongoing treatment process. He also believes in working in a collaborative manner with the patient’s other providers, in particular, psychologists, clinical social workers and primary care physicians. His area of treatment specialty include pharmacotherapy (evaluation for medication needs and ongoing medication management), crisis stabilization, anxiety and mood disorders, geriatric psychiatry, interface between psychiatry and primary care medicine, and cross cultural psychiatry.